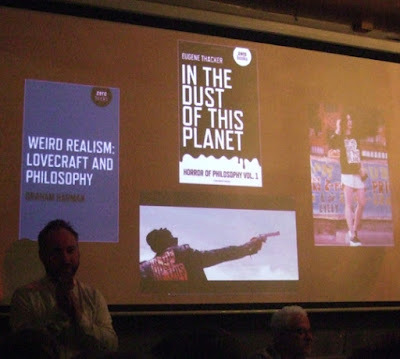 Last Thursday I was one of the lucky ones who managed to hear the talk on Cthulhu and Contemporary Occultures at the London Fortean Society, because it sold out very soon after tickets went on sale. Over the last decade, HP Lovecraft’s fictional Cthulhu mythos has increasingly gained traction within popular media, being referenced in novels, comics, films and successful TV series such as South Park and True Detective. Lovecraft’s best known creation has also exerted a profound influence on contemporary magical, ufological and conspiratorial lore. 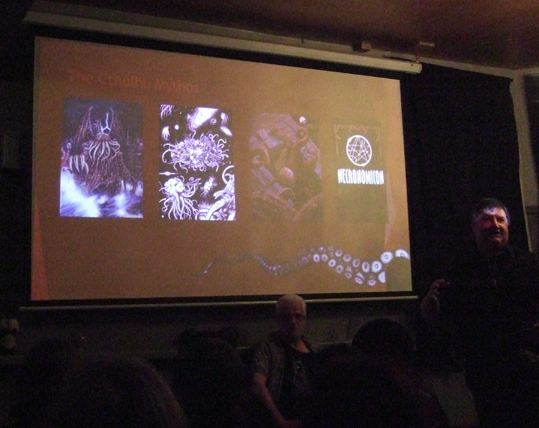 However, the main part of the talk was about the intersection between the Cthulhu mythos and the occult. While the stories by HP Lovecraft were written as fiction, the mythos has been utilised in reality by those practising the occult. The appeal is the lure of forbidden knowledge that is at the heart of the stories. There have been many attempts by occultists to order the Great Old Ones - the immensely powerful, alien and ancient beings that are the threat to humanity in Lovecraft's books, yet can teach incredible secrets to their followers at the expense of their sanity. This ordering has include attaching them to the Kabbalistic Tree of Life. Some occultists have even said that Lovecraft was a channel for real entities even if the writer himself didn't know it. Kenneth Grant was one of the first occultists to explore the boundaries between fiction and magic. He used fiction as a jumping off point into magical realms. This took off further in the 1980s with the rise of chaos magic. Justin Woodman was himself a member of the chaos magic group The Esoteric Order of Dagon in the 1980s and 90s, along with the late Steve Ash. I have heard both of them describe rituals to invoke the Great Old Ones in the past and Justin gave another account at The London Fortean event. The tales are fascinating and highly entertaining, although I have to say that over the years I might have detected them growing just a tiny bit with the telling. 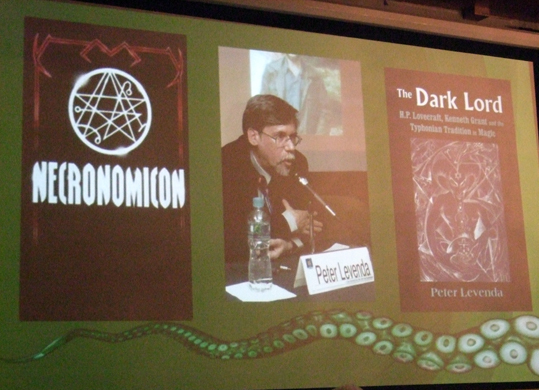 Phil and Justin went on to look at how different strands of interest in the Cthulhu mythos had merged over the past few decades. Back in the 1970s, 80s and 90s, various groups were interested in the Cthulhu Mythos from different perspectives, but they were very separate. 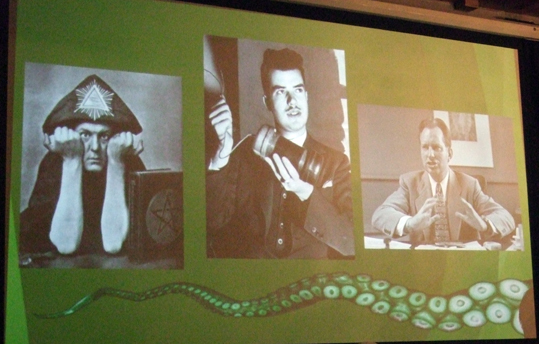 There were fans of horror and SF fiction, people who played the Call of Cthulhu roleplaying game (of which I was one), and occult groups using the mythos in ritual workings. However, they didn't really interact with each other. 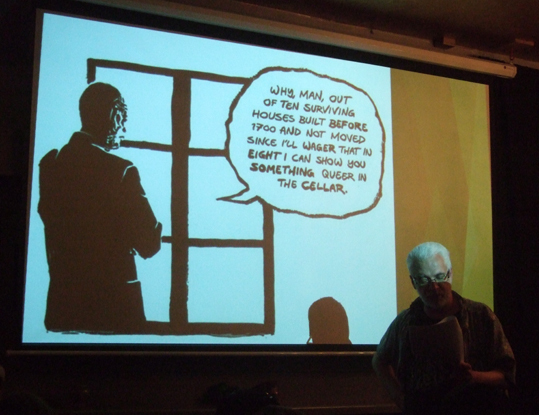 Phil and Justin ended by talking about how academics and philosophers are now exploring the works of HP Lovecraft. 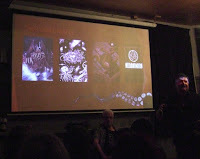 The final picture (below) shows serious philosophical books about Lovecraft. The cover of one of them, In the Dust of This Planet, has gone on to be printed on T-shirts and jackets worn by celebrities.